Family Health History: What Is It and Why Does It Matter? Family members share more than similar looks. You may recognize that you have your father’s curly hair or your mother’s button nose. But it’s not so easy to see that your great-grandmother passed along an increased risk for both breast and ovarian cancer. Keep reading to learn how to gather your health history and what information you should include. The general rule for family health history is that more is better. First, you’ll want to focus on immediate family members who are related to you through blood. Start with your parents, siblings, and children. If they’re still alive, grandparents are another great place to start. They may know partial histories of many members of your family. You can also gather information from your aunts and uncles, and other blood relatives. Once you move beyond this core circle of family, genetic makeups change so greatly that you may not be able to learn much about your own risk. Still, keep information handy for any family members you learn about during your search for medical history. It may be helpful down the road. Make sure you write down or electronically document the health information your relatives provide. 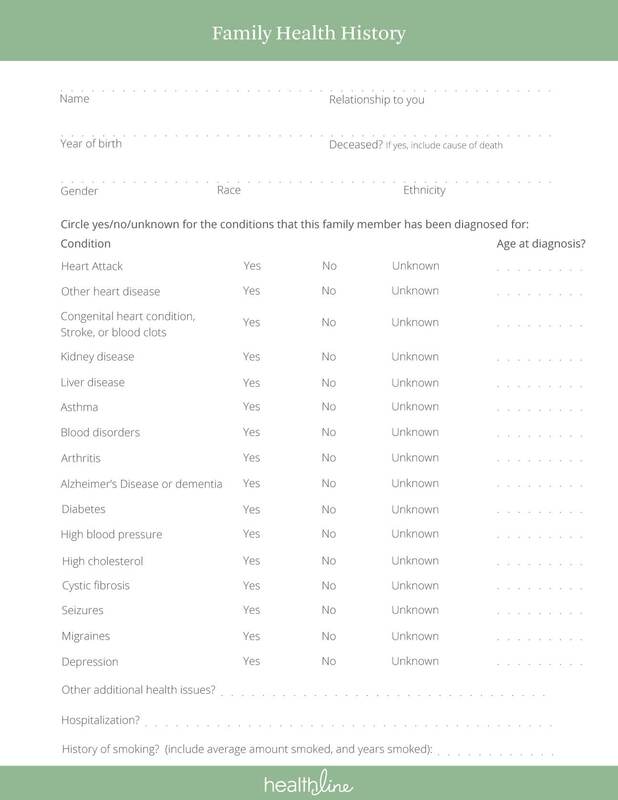 You can use this form to record your family health history. Just fill out one form per family member. You can also fill out a form for yourself, and share that with your family members. Once you’ve collected all this information, you need to store it somewhere safe. You can use your own personal computer, but safe digital storage options are also available. For example, the U.S. Department of Health & Human Services and the surgeon general offer a web-based tool called Family Health Portrait. You can store, save, and share your family history using this tool. Look for other options, like ancestry websites and smartphone apps. Knowing your own health history is important, but sharing it with your doctor may be more important. That’s because your doctor can help you interpret what it means for your current lifestyle, suggest prevention tips, and decide on screening or testing options for conditions you may be more at risk for developing. Although genetic tests can help identify potential risks you may have inherited for a specific disease, they don’t guarantee that you’ll develop that disease. Results may show you have a predisposition to several conditions. While you may never actually develop any of these, you might feel the added anxiety isn’t worth the knowledge. Seriously consider the benefits and concerns you may have with knowing your genetic risk factors before you do any testing. Also talk to your doctor if you need more help figuring out how to uncover your health history or what questions you should ask.